What effect do Clarkson's reviews really have on cars sales? He is the scourge of the industry, who with one well-aimed comment can send sales through the roof or close factories. Really? We investigate the fortunes of the cars Clarkson trashed. IN APRIL 2005, MG Rover called in the administrators. Allegedly, it wasn’t the fault of the directors who had taken £40m in pay and pensions. Neither was it down to the limited model range. It wasn’t even because of the poor reputation that British cars had from the days of the Austin Allegro. Owners were quick to join the condemnation: “His tasteless, uninformed anti-Rover prattle dissuaded many potential customers from trying out and buying the cars,” read one of the printable website forum posts. Anyone who had been in Luton four years earlier would have experienced a sense of déjà vu. At the time, Vauxhall had announced that it would stop producing the Vauxhall Vectra there. The workforce blamed Clarkson. He had savaged the model on Top Gear for being so dull that the only thing he could think to talk about was its coat hooks, and took a similar tack in The Sunday Times, devoting his column to the reed warbler instead of the car. The coverage reportedly caused a walkout at Vauxhall’s factory and led to the managing director complaining to the BBC. The car was seen as a disappointment because it at first sold fewer models than its older rival, the Ford Mondeo. There may not be a definitive link between Clarkson’s comments and Vectra sales (see graph below) but some note that the Vectra name no longer exists, while Mondeo is still going strong. The industry calls it the Clarkson effect, which is said to make or break a car’s fortune. A favourable review will have thousands heading into the showrooms. A negative review will have a similar effect — except that the hordes will be buying rival models. This pied-piper phenomenon has marketing heads waking up in cold sweats the night before a review is published, and agonising over whether they should lend him a car to test-drive, running the risk of an acerbic and instantly memorable putdown. Such as in the case of the Porsche Cayenne (“I have seen more attractive gangrenous wounds than this”), the Peugeot 307CC (“It’s like running into an old girlfriend who, since you last saw her, has had three children, cut her hair, eaten all the pies and given up)” and the Perodua Kelisa, which “sounds like a disease”. “The Jeremy Clarkson effect is renowned within the car industry,” says Jamie Matthews, chief executive of Initials Marketing, an agency that develops campaigns for car brands. “He can make or break car launches. So how much is a positive verdict in Britain’s bestselling Sunday broadsheet worth? About 7,000 cars, according to one large manufacturer. That’s the number of extra vehicles it expects to sell if one of its cars gets a rare five-star review in The Sunday Times. A spokesman for the company, who asked to remain anonymous, said that the Clarkson effect doesn’t stop there. It helps bring more people into showrooms and paints the rest of their range in a good light. 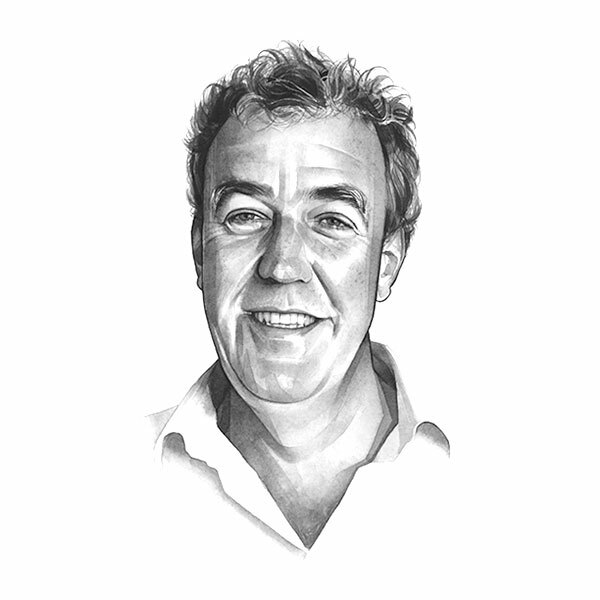 As an added bonus, Clarkson recommends the cars he likes to friends, who then go and buy one. One upmarket car maker witnesses an 800% increase in website visits if a particular model is well reviewed by Clarkson. The fear for motoring’s marketing people, though, is that he’ll find a car that is worse than the Vectra, which in turn could lead to a consumer boycott, factory closures and thousands on the breadline. Or perhaps not. As with everything about the man, the Clarkson effect is prone to exaggeration, and he’s the first to admit it. “‘I don’t have any influence over what people do, I really don’t. It makes no difference what I say,” said Clarkson at the Hay festival in 2008. He emphasises the point in a column from July 1999, explaining how the Chrysler Voyager became the second-bestselling people carrier in Britain just after he described it as “the worst car you can buy now”. Then there was the time he awarded just one star to the previous-generation BMW 1-series. It became one of the five bestselling cars in its class. That argument doesn’t wash with road safety campaigners. Co-op insurance, the road safety charity Brake and the Green party are some of the groups who have criticised the presenter. They claim he encourages reckless driving. Richard Brunstrom, once Britain’s most senior traffic officer, blamed him for turning motorists against speed cameras in 2004. But Clarkson’s claim that no one takes any notice of what he says may be an exaggeration in itself, as there is apparently strong evidence that he can move markets internationally, close factories and influence the development of new products. Just not necessarily in the world of cars. In 1998 he was blamed in a clothing industry report for causing a 14% drop in jeans sales. Children and teenagers saw him on screen and decided that “they do not want to look like their dads”, the report by the market research company AC Nielsen stated. Soon afterwards Levi’s laid off 6,000 staff. Clarkson said that he would stop wearing his favourite trousers — if the clothing firms paid him £40m. But whether he’s the force behind thousands of car sales a year, or completely ignored by the hundreds of millions of people who watch his shows and read his columns, one fact remains constant: it simply doesn’t matter because he just tells the truth. “I’m not employed to think one thing and say something else,” he wrote in one column. “Am I supposed to recommend all cars that are made here, irrespective of their price, performance or quality? Because if I am, all of you must go out tomorrow and buy a London cab.